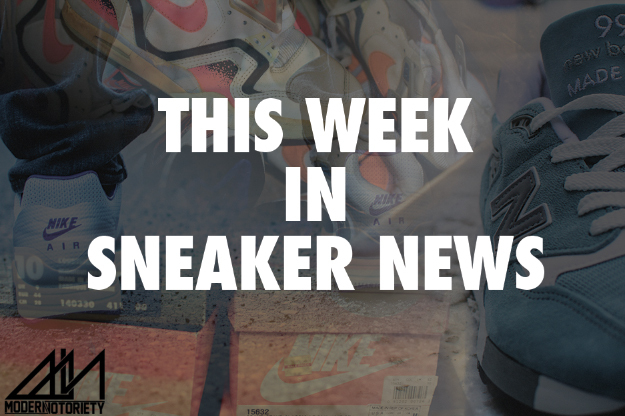 In case you missed it, here’s a round-up of the best sneaker stories to drop this week. Click on the links to view the full story. Tons of new Kobe 9 news including his debut of the “Lakers” colorway, images of the blue “Perspective” colorway, and much-anticipated images of the Kobe 9 low cut version. Air Jordan 1 High Retro “Barons” Release Date – Jordan Brand releases another retro in this classic model, this time with an OG-worthy colorway. Air Jordan 3 “Infrared” Retro – Check out these new images of this upcoming release that will surely sell out. Riccardo Tisco x Nike Air Force 1 Collection – With all the waves the Givenchy designer’s been making lately, it was only a matter of time until this collab happened. Tisci puts his magic touch on three different models. Janoski Summer 2014 Preview – Peep what Nike SB has in store for you this season. Asics “Lovers and Haters” Pack – Valentine’s Day is around the corner–which shoe are you copping for yourself and your significant other? Rare Air: Michael Jordan Shatters Backboard – MN revisits a lesser-known MJ story. Do you think this moment deserves a special shoe/colorway? Nike Air Safari “Monotones” Pack for Spring 2014 – A super clean, all-suede take on the popular Safari collection. Jordan Brand BHM PE Collection – View the entire Black History Month Player Exclusive Collection from all your favorite JB athletes. Air Jordan VI GS “Magenta” – How many of you wish this colorway would release in adult sizes? Nike K.D. 6 “D.C.” and “Career High” – KD’s been on fire on and off the court this week. Peep these new colorways inspired by his hometown of Washington, D.C. and his 54-point career high. Puma Disc “Tropicalia” Pack – A wavy print perfect for the spring season. Street Notoriety: Tyler Nguyen – A street style feature on a Seattle-based sneakerhead featuring some rare Yeezy 2’s.